While our name, Bel-Air Cases, might conjure up an image of a posh Los Angeles enclave teeming with gracious manor homes, our cases are tough and durable, capable of standing up to the rigors of transport. In other words, our heavy-duty shipping cases are attractive enough for the glamour of Bel-Air and tough enough for the gritty underworld of shipping and transport. Read on to learn more about our amazing custom shipping cases. Each shell of our custom shipping cases is crafted from high-density polyethylene, a type of plastic that is extremely lightweight and durable, not to mention extremely affordable. As your case gets jostled around during transport, the plastic shell will absorb the impact rather than impacting and potentially damaging your equipment. The design itself also improves impact resistance, and each shipping case includes molded-in bumpers for extra protection. In addition to creating the body of your shipping cases out of high-density polyethylene, we create valances from aluminum, which, just like high-density polyethylene, is both lightweight and highly durable. This valance is the backbone of our shipping cases, providing a highly level of impact resistance. For the hinges and latches, we use steel to ensure that your case stays closed securely, even during the most turbulent transport scenarios. We mean that, literally. The design of each shipping case features molded-in ribs so that you can stack multiple shipping cases easily, which is great for transport as well as storage. While you probably aren’t shipping your cases to Antarctica, our heavy-duty shipping cases can withstand temperatures as low as -80 degrees Fahrenheit. Our cases also can withstand temperatures up to 180 degrees, so you can rest assured that your case won’t be comprised by changes in temperature. While it might be tough on humans to endure a torrential downpour, your Bel-Air shipping case is moisture-resistant and water-resistant, keeping your equipment dry and safe. The shipping cases also are solvent-resistant, as well, so if you case ends up in the laboratory of an evil comic book villain, its exterior will be able to withstand exposure to most liquids. Shipping delicate and expensive equipment is costly, but the light weight of our shipping cases ensures that you won’t have to pay more than absolutely necessary to ship your precious items. Additionally, because our cases prevent damage, you won’t have to make costly repairs or replace damaged equipment. Airlines are well aware that transport is tough on luggage and shipping cases, and not all cases can handle frequent transport and shipping. The Air Transportation Association has set guidelines for case construction and cases that meet these guidelines provide the level of protection needed to keep your equipment safe during handling and flights. Our cases are built to meet these stringent specifications, as well as many Military specifications. If you look on our homepage, you see that we advertise the creation of custom shipping cases. If you browse a bit further, you will see that we also offer a wide range of “standard” case sizes. You can select one of these standard sizes or have our design team create a case based upon your unique specifications. What we don’t offer are “stock” or “off-the-shelf” shipping cases. We don’t have a warehouse full of one-size-fits-all cases. Each of our shipping cases is made to order, inside and out, so when you place an order, we will be building your case from scratch, even if you select from one of our many standard sizes. The exterior of our shipping cases is designed to absorb impact and protect your equipment, and so is the interior. We offer custom foam interior design to ensure that every centimeter of your equipment is protected. We can do a basic foam liner or create custom hand-cut or die-cut foam interiors, depending on your needs. We never use pick-or-pluck foam, which is a common foam interior option for many shipping cases. This type of foam does not provide adequate protection for your products. First of all, you have to pluck away bits of foam to create cavities for each part of your equipment. What if you pluck away a bit too much? It’s not like you can just re-attach the foam. Secondly, this type of cheaper foam tends to break down over time, further reducing its protectability factor. Of course, you also end paying up for extra foam that you pluck away and toss. It’s far better to let us design a custom foam insert for each of your shipping cases. Thermoforming is a process by which large sheets of plastic are heated and then vacuum-forced into molds. This is how we create each of our custom shipping cases. We are the first company to create shipping and carrying cases use this method, which is why we call our products the “Original Vacuum-Formed Equipment Cases.” Thermoforming is a versatile process that allows us to quickly create heavy-duty shipping cases in virtually any configuration. Who says a shipping case has to be dull and boring? We can create shipping cases in a variety of colors, including white, silver, black, yellow, orange, red, olive, green and blue. We also may be able to provide custom colors and color matching services. Your shipping cases also can be personalized to feature a variety of graphics or logos, and we also can add engraved plates or custom decals to your cases. 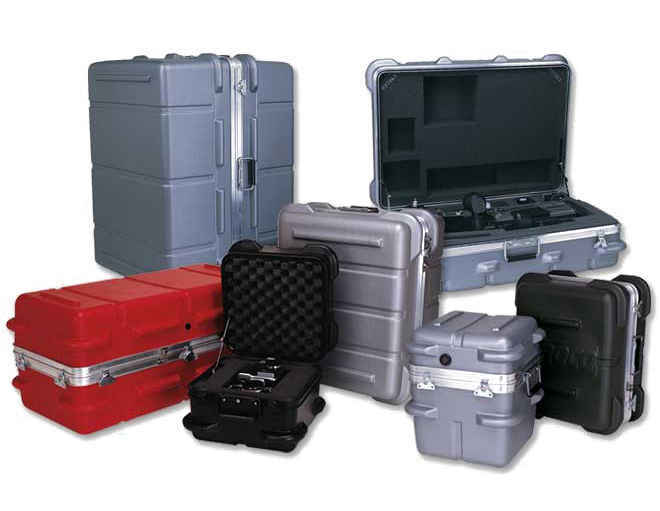 If you need any size of custom shipping cases, contact the team at Bel-Air Cases. You can contact us by phone at (866) 235-2472 or simply click on the Contact Us tab on our homepage and fill out our quick contact form and one of our friendly customer service specialists will be in touch with you shortly.